Which Water Garden will you choose? Okay, time for the nitty gritty... which type of hydroponics system will you need for your garden? In the spirit of keeping things simple, we have carefully chosen 4 different hydroponic systems you might want to consider. And guess what? You don't have to decide right now. You only have to make one decision at this point.... do you want an open, full-sized 4X4 garden, or do you want to garden in an enclosed grow box? If you want to build a great, prolific, full-sized hydroponic system, then order Simon's Simple Hydroponic Plans EBook. This thing is great; it includes complete, concise, detailed plans for putting together all 4 of the best gardens out there: Ebb & Flow, Top-Drip Dutch Buckets, Deep Water Raft and the Autopots Farm. You don't need to decide right now which way to go! This book describes the systems, helps you decide which one and what size, and then tells you step-by-step how to build each one. It also includes complete plans for our unique HydroPad® PVC stand. Detailed parts lists and where to find those supplies is included. 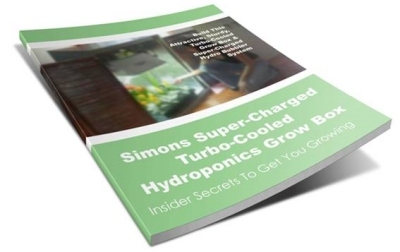 Read more about Simon's Simple Hydroponic Plans EBook here. You might just be interested in making a grow box to house your hydroponics garden. Now why would you want to do that? Maybe you live in a tiny apartment with no spare bedroom. And you want a hydroponic garden! The solution: a grow box or closet. You can either set one up in an existing closet, or buy a wardrobe (free-standing cabinet) and convert it. Our Grow Box E-Book tells you exactly how to do just that. Believe it or not, a grow closet can actually provide a cooler garden than just open air under lights. Why? An enclosed box equipped with an exhaust fan and air intake vents creates an excellent air-cooled vortex chamber. A perfect environment in which your plants will thrive! A grow box also helps to hide the bright light, sounds and earthy smells of your garden. Out of sight, out of mind. Hydroponic huts or "grow boxes" are rapidly becoming a very popular and trendy option for the space-limited gardener. And... yep, you guessed it.... we've got the goods on this one, too! We did all the research and experimentation until we evolved our own unique fantastic grow box, and the perfect hydro bubbler system to fit inside. It holds 6 full-grown plants, and you would not believe how fast they grow in this baby! 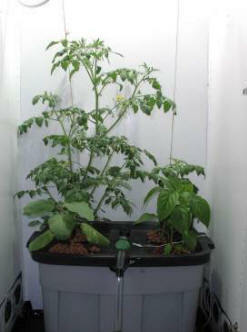 Read more about our Super Turbo-Cooled Hydroponics Grow Box with Bubbler System here . The bubbler system can be built as a standalone unit in open air. It works just as well out of the closet as in. Whether you decide to build a closet or not, our bubbler unit will get you growing in no time! Okay, there you are... all pumped up and ready to build your hydroponics garden setup. Where to start?